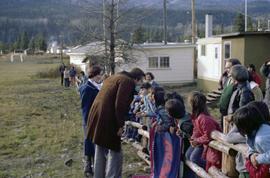 Photograph depicts the entrance to Kispiox Village, over the Kispiox River. 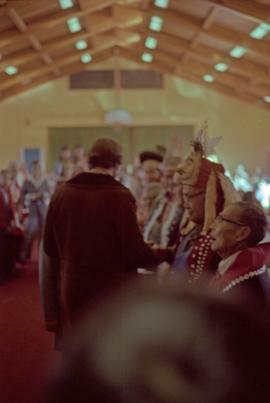 Photograph depicts Minister of Indian Affairs and Northern Development Hugh Faulkner shaking hands with First Nations elders wearing button blankets. 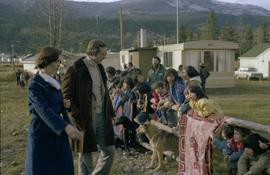 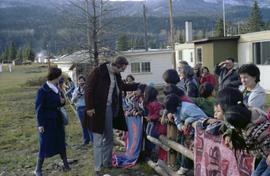 Photograph depicts Minister of Indian Affairs and Northern Development Hugh Faulkner greeting First Nations elders wearing button blankets. 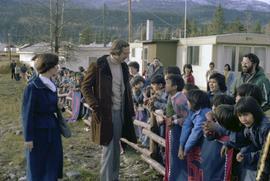 Photograph depicts Iona Campagnolo and Hugh Faulkner talking with a group of children and adults at Kispiox as part of Campagnolo's Skeena riding tour. 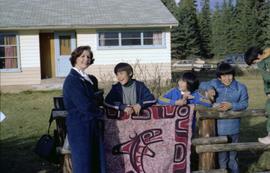 First Nations art is pictured on hanging blankets. 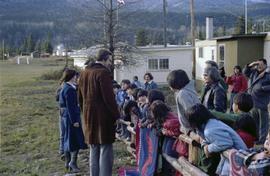 Photograph depicts Iona Campagnolo and Hugh Faulkner talking with a group of children and adults at Kispiox as part of Campagnolo's Skeena riding tour. 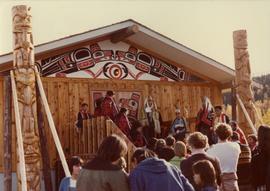 First Nations art is pictured on a hanging blanket. 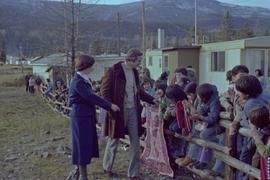 Photograph depicts Iona Campagnolo and Hugh Faulkner talking with a group of children and adults at Kispiox as part of Campagnolo's Skeena riding tour. 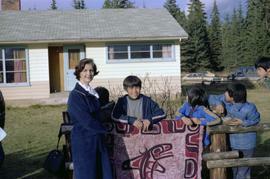 First nations whale art on a hanging blanket is also pictured. 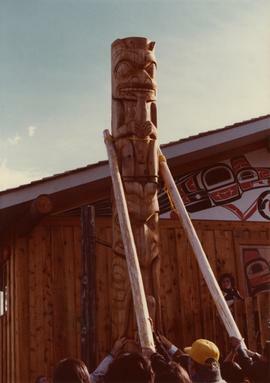 Photograph depicts Iona Campagnolo crouching near a carved wooden totem pole in order to help other members of the Kispiox community with its transportation at a pole raising ceremony. 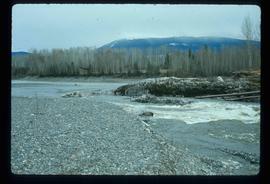 Photograph was taken on Campagnolo's Skeena riding tour. 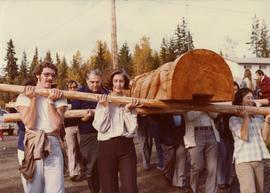 Photograph depicts Iona Campagnolo helping to transport a carved wooden totem pole with other members of the Kispiox community at a pole raising ceremony. 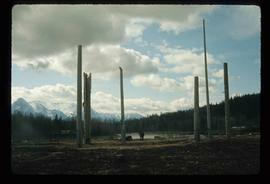 Photograph was taken on Campagnolo's Skeena riding tour. 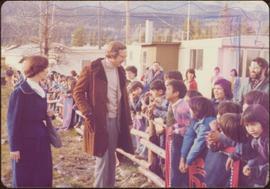 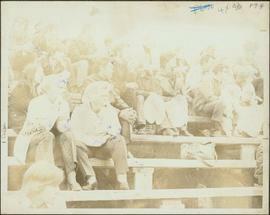 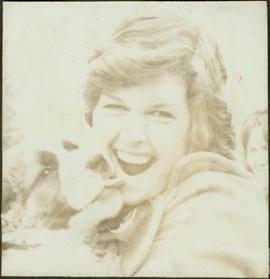 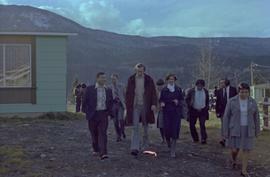 Accompanying handwritten note on UNBC Chancellor’s letterhead reads: “1974 Campaign, Kispiox Rodeo with Neil Sterritt”. 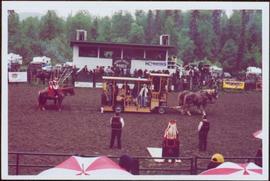 Campagnolo holds microphone while wearing cowboy hat, and standing on a wagon pulled by team of horses. 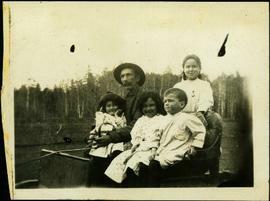 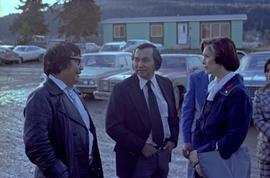 Photograph depicts Iona Campagnolo speaking with Chief of the National Indian Brotherhood George Manuel, Gitxsan artist and hereditary chief Walter Harris, an unknown man, and an unknown woman at Kispiox as part of her Skeena riding tour. 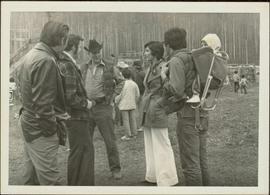 Photograph depicts Iona Campagnolo with an unknown man at Kispiox as part of her Skeena riding tour. 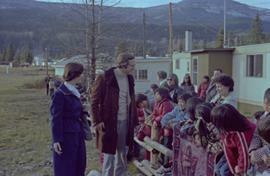 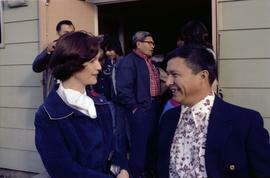 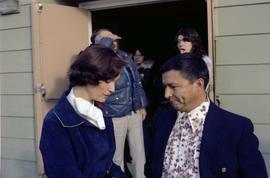 Photograph depicts Iona Campagnolo speaking with an unknown man at Kispiox as part of her Skeena riding tour. 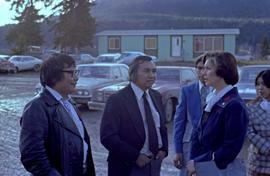 Photograph depicts Iona Campagnolo standing with Hugh Faulkner, George Manuel and others at Kispiox as part of her Skeena riding tour. 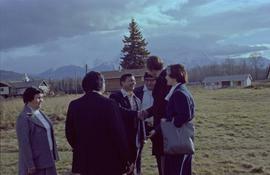 Photograph depicts Iona Campagnolo standing with Hugh Faulkner, George Manuel, Walter Harris and others at Kispiox as part of her Skeena riding tour. 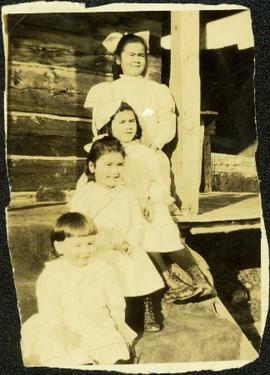 Photograph depicts Iona Campagnolo standing with unknown children by a First Nations art blanket representing a whale at Kispiox as part of her Skeena riding tour. 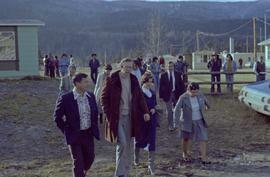 Crowd visible in background.Handwritten annotation on verso reads: “Campaigning 1974 Kispiox". 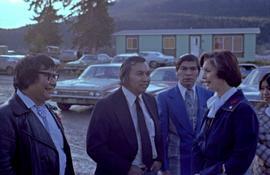 Photograph depicts Iona Campagnolo standing with Chief of the National Indian Brotherhood George Manuel and Gitxsan artist and hereditary chief Walter Harris. 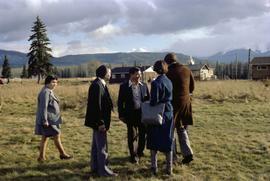 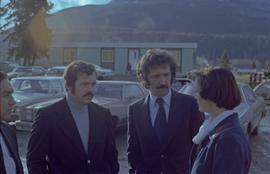 Photograph depicts Iona Campagnolo speaking with three unknown men in suit jackets at Kispiox as part of her Skeena riding tour. 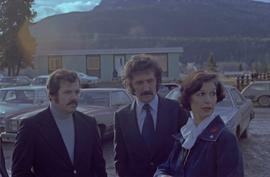 Photograph depicts Iona Campagnolo glancing away from two unknown men at Kispiox as part of her Skeena riding tour. 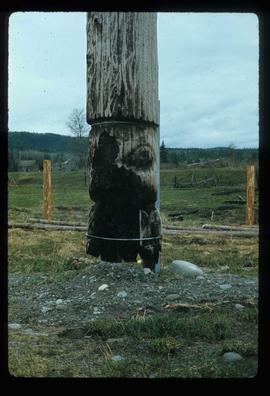 Image depicts an old, partially burnt totem pole in Kispiox, B.C. 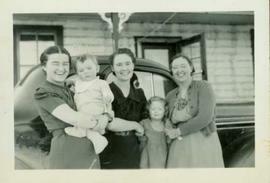 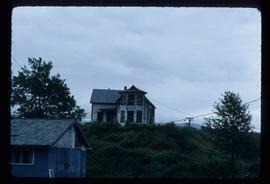 Image depicts an old house in Kispiox, B.C. 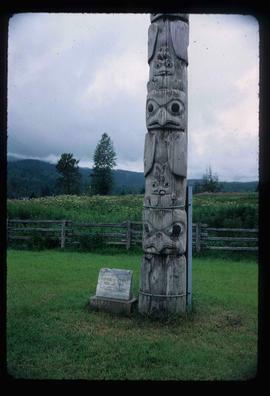 Image depicts a totem pole beside the grave marker of the Chief Lu-dal-da-zuatz, in Kispiox, B.C. 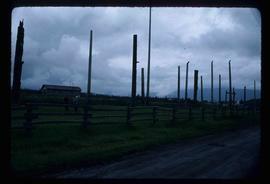 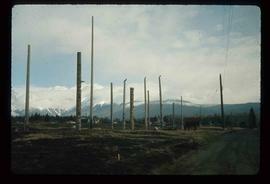 Image depicts numerous totem poles in Kispiox, B.C. 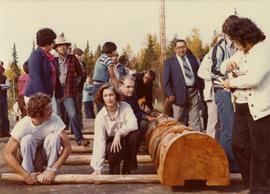 Photograph depicts members of the Kispiox community transportating a carved wooden totem pole at a pole rising ceremony. 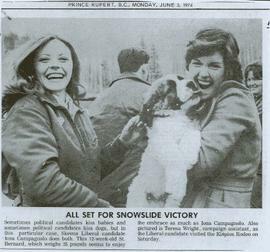 Photograph was taken on Campagnolo's Skeena riding tour. 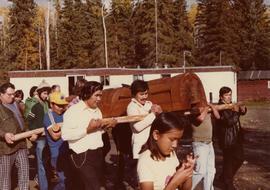 Photograph depicts male members of the Kispiox community transportating a carved wooden totem pole at a pole rising ceremony. 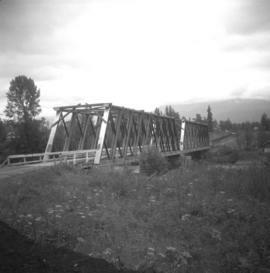 Photograph was taken on Campagnolo's Skeena riding tour. 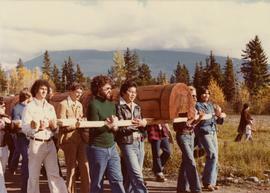 Photograph depicts Kispiox community members helping to raise a totem pole at the official opening of the new Kispiox Cultural Building. 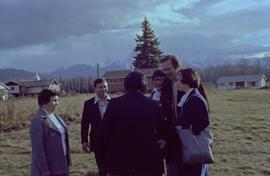 Photograph was taken on Campagnolo's Skeena riding tour. 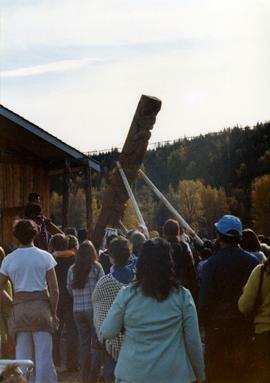 Photograph depicts Kispiox community members watching a totem pole being raised at the official opening of the new Kispiox Cultural Building. 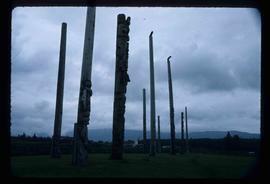 Photograph was taken on Campagnolo's Skeena riding tour. 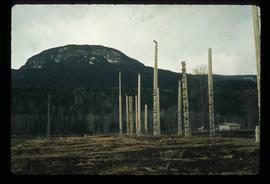 Buildings and power lines cross midground, mountains stand in background.Handwritten annotation on verso reads: “Kispiox with Hugh Faulkner”. 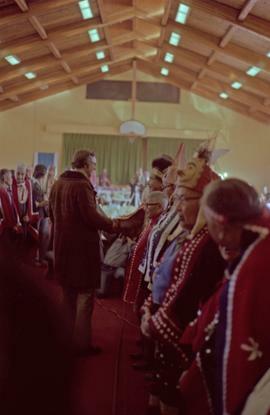 Photograph depicts elders, chiefs, and councillors outside the new Kispiox Cultural Building following the pole-raising at the official opening of the facility. 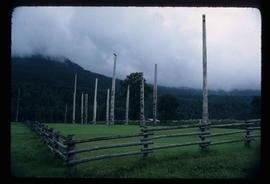 Photograph was taken on Campagnolo's Skeena riding tour.